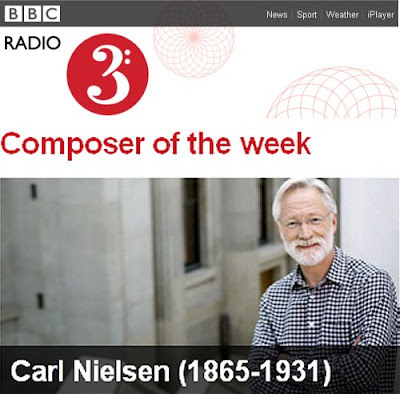 From BBC Radio 3 website. More on the cult of the presenter here. Oh, ye Gods. This comes also within the ambit of the sense of history, the look of it, the feel of it, the smell of it, the apprehension and comprehension of it. I've said elsewhere that the failure any longer to teach history and teach it well is a catastrophe (back in the news last week) and my thoughts on it are not just the bletherings of an ageing history professor. Here we have an example of the preponderant ignorance and dismissal of history, and beyond a doubt there are now people wandering around thinking that's what Nielsen (whose concertos I was listening to on the weekend by chance) looked like. by asking someone, anyone, to tell me what they knew about Hitler and Nazism. Nothing - not one could tell me anything at all. I hope no one is asking what the hell that photo has got to do with history, for it has everything to do with it, including the fact that there are now people thinking Nielsen looked like an avuncular, bearded Scot with a shirt and photographer way ahead of their time. On a related point, further "improvements" to the BBC Radio 3 schedule, in particular changes to the breakfast programme, have caused considerable controversy recently. Do I have the doubtful honour of providing the Daily Mail with a headline? I do believe you do have that dodgy honour, Bob. One might say it puts you in dubious company, but so does everything these days, up to and including getting a knighthood, musical ones not excepted.